Home - Deborah Kaplan Polivy, Ph.D. I help not for profit organizations access resources to further their missions. I concentrate on obtaining support from individuals for annual or capital campaigns as well as endowment. Each of my strategic plans is unique and created for the particular organization. 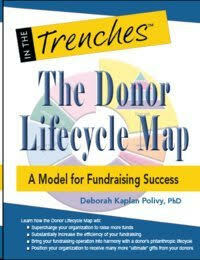 Deborah’s second book, The Donor Lifecycle Map: A Model for Fundraising Success has been published by Charity Channel Press. 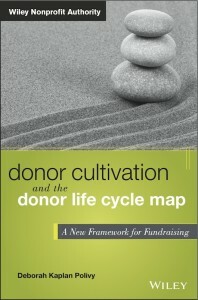 This book expands on her experience using the Donor Lifecycle Map in the field and is based on the model proposed in her first book, Donor Cultivation and the Donor Lifecycle Map: A New Framework for Fundraising (Wiley, 2014). She describes achievements and impediments and makes recommendations for fundraising success. In this new publication Polivy describes how strategic fundraising planning focused on donor retention and using the Donor Lifecycle Map as its framework leads to long term financial gains for nonprofit organizations. However, Polivy writes, that when she tried to introduce this approach in the field with clients, she found that the primary focus of fundraising professionals and volunteers was the Donor Pyramid – especially its highest point, major donors. Polivy’s innovation is creating a model for strategic planning that incorporates the concepts of both retention and gift size – the Donor Lifecycle Map and Donor Pyramid – which together, she concludes, provide a useful paradigm for building feasible and successful fundraising plans. The book can be purchased on Amazon or through Charity Channel Press. Watch a short video about Deborah Polivy’s presentation at the Sanford Institute of Philanthropy in Oakland, California in May, 2017, and contact her if you are interested in a similar workshop. Coaching development staff and working with Boards of Directors and CEOs on fundraising has become an increasingly large part of Deborah’s work. Please give her a call at 860-242-4424 or send a message for more information. Dr. Polivy has a consistent track record of providing quality services to a range of clientele. Learn more about Deborah Polivy and find out how she can help you take your organization to the next level. I think that Ms Polivy is doing a fantastic job in keeping us focused and moving in the right direction.